It seemed like the chances of more of the Ace Attorney series leaving Japan was dead. The last AA game we got was Ace Attorney Investigations: Miles Edgeworth. The second AAI game was never officially localized, although there is a fan translation in the works, with the first two cases completed. But now Ace Attorney 5 is being released officially (albeit only on the eShop, and no quiz DLC because apparently we can’t handle Japanese culture or know how to use Google), and the demo dropped this week, so I gave it a whirl in an effort to whet my appetite for AA. 1. The demo starts off with a bang – literally. A bomb explodes in the courtroom, though fortunately the room was evacuated before it detonated, so there were no deaths. Or were there (dun dun dun)? This is an AA game, after all. But a case where you’re not solving a murder mystery would be an interesting change of pace, and judging from the demo that seems to be where this case is going. The defendant for the trial is Juniper Woods, Athena’s childhood friend, who was there when the bomb went off and seems to be a timid sort. 2. The controls are pretty much like the other Ace Attorney games (except for the AAI games). Tap the panel to go to the next message, hold down the panel or the B button to fast forward, tap on the icon at the bottom center of the screen or press the Y button for the conversation backlog, and tap the Court Record button or R to look at evidence and profiles. In court, pressing R (or tapping the Present button) allows you to go through the Court Record to find evidence that contradicts a witness’s testimony. Pressing the Present button or X refutes the witness’s testimony. If there are no contradictions, you can press L or the Press button to press the witness for more information. The game provides refreshers for the game mechanics in case you’re like Phoenix and are a bit rusty on things, but you can skip the refresher course Athena offers if you like. 3. 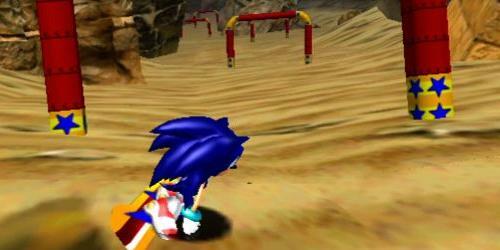 The characters are now rendered 3D instead of with the 2D sprites used throughout the series. They manage to be just as expressive and animated as their 2D brethren. I’d thought that the character would be less animated due to the transition to 3D, but so far that doesn’t seem to be the case, which I’m glad for. The backgrounds look like they’re still 2D, though you can see details moving in them like beams of sunlight and smoke. There’s panning shots at different angles when the audiences starts muttering after a particularly hard hitting revelation, which adds to the impact. 4. There’s now animated cutscenes accompanied by voice acting. They look polished and well animated, the colors vibrant and outlines sharp. They seem like what a full AA anime would look like. Hey, there was a live action AA movie, so an anime wouldn’t be too far off. 5. Speaking of the voices, the voices generally fit the characters, though I’m kind of mixed about Phoenix’s voice. I don’t know what it is about it – guess it’s different from what I’ve imagined his voice would sound like if he had more voice clips than just “Objection!” and “Hold it!”. But it’s not bad, and I’m sure I’ll get used to it as I hear it more. 6. 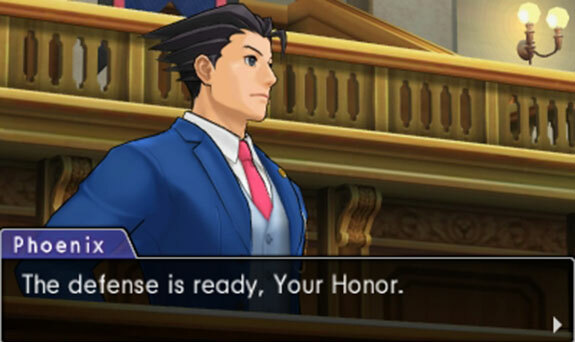 The new assistant in this game is Athena Cykes, a rookie defense attorney that just joined Phoenix’s team. Her power is special hearing that lets her detect a witness’s emotions from the tone of their voice. She can use her computer to analyze emotions and images through the Mood Matrix. Different markers light up depending on their feelings – happy, angry, sad, or surprise. When an emotion that seems inconsistent with the testimony, press L (or the Pinpoint button) and pick the unexpected emotion. This can draw out new testimony from the witness. This system seems somewhat similar to the Perceive system, except with more technology involved and tone of voice used instead of body language. 8. Apollo returns as well, still part of Phoenix’s team, and he’d been injured when the bomb went off. As a result he’s all bandaged up and can’t show off his Chords of Steel in court. Man, and when I first saw his art with him all bandaged up and wearing his jacket on his shoulders, I’d thought he’d gone rogue or something and was trying too hard to look cool and menacing. Also, while Athena seems likable so far, I still hope Maya makes an appearance in this game (Pearl does, after all), but I guess we’ll have to see in the final game. 9. The humor that the AA series is known for is intact, as are the punny names (Ted Tonate, anyone?). The judge even lampshades that this is a demo by saying a fast verdict (Athena promises within 10 minutes – no pressure, right?) might not be a bad thing because “There’s not much time in a demo”. Ah, good old leaning on the fourth wall. Though there was a typo with “this rule that out”. While there were also typos in previous games, I hope the final game isn’t too littered with them. 10. The demo ends with a cliffhanger, after the first two testimonies. While I wish it worked something like the Etrian Odyssey demos and let you carry over some data (in this case, skip the first case), I can also see why that might not work as well for this kind of game, especially given the first case apparently plays out differently in the full game. It did, however, let you sample what’s coming, including the new Mood Matrix system and the vamped up graphics. The full game releases October 24, so be sure to check here after that for a full review.